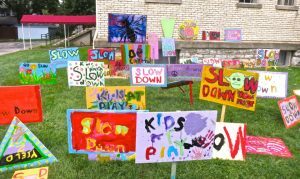 In an effort to keep our neighborhood safe, and provide a fun activity for kiddos during Dumpster Days, the HOA is inviting Summit Park kids and families to help paint signs that will be posted around the neighborhood. The signs will remind drivers to please slow down and drive safely around Summit Park. Want to help volunteer at the event? Sign up here.